The Bliss Dam and the Upper and Lower Salmon areas have boat ramps. Scenic Hagerman Valley has a rich history. Pioneers following the Oregon Trail traded with Native Americans in the area for fresh trout. The famous Hagerman Fossil Beds National Monument provides a look at life from millions of years ago. Thousand Springs is known for its fresh underground springs. The springs flow from the Snake River Plain aquifer and the canyon walls. We care for day-use parks for picnicking and other recreational activities at the site. The Malad parks are a great place to picnic, fish or rest. 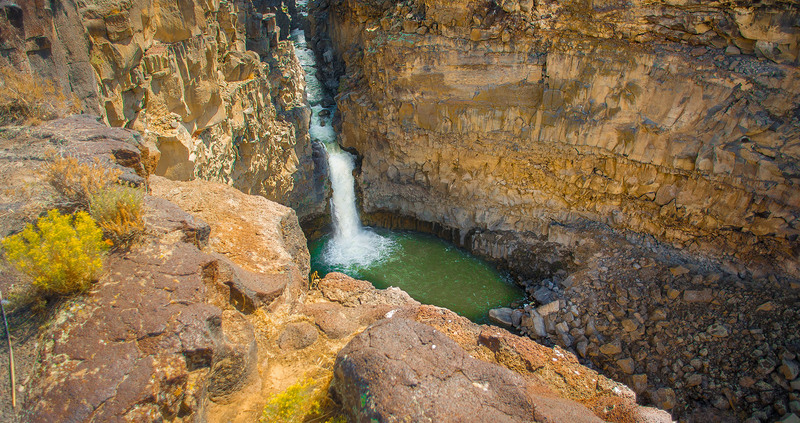 Nearby Malad Gorge is a great example of Idaho’s diverse geology. A state park overlooks the gorge until it empties into the Snake River. The Hagerman Chamber of Commerce website offers a detailed map of the area. Visit the Idaho Parks and Recreation website and our Parks section to learn about other parks and recreational areas. Jaw tagged rainbow trout are stocked in the Snake River between Shoshone Falls and C.J. Strike Dam. We stock these waters each year to improve sport fishing. Many of these catchable-sized stocked fish have been fitted with either one or two metal jaw tags. You could earn a reward and be entered into a drawing for $1,000 by reporting the tags. Visit our Fish Tag Information page for details.